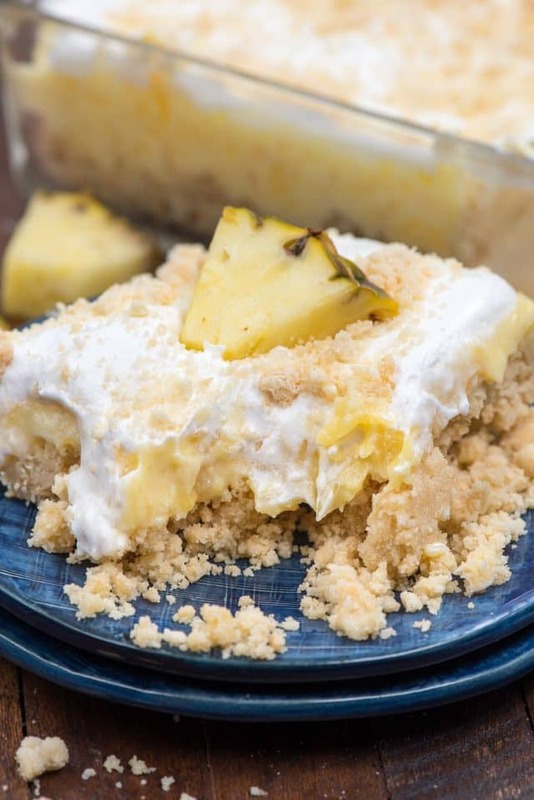 This Pineapple Dream Dessert is a no bake pineapple lush recipe. It has a shortbread crust and is the perfect no-bake dessert recipe! What is a dream dessert anyway? There are so many names for this no-bake casserole I never know what to call it! Lush. No bake dessert. Dessert lasagna, icebox cake. This dessert has SO many names it’s hard to pick just one. I finally settled on a Pineapple Dream Dessert because when I think of pineapple I think of Hawaii and Hawaii is my dream. Have you ever wondered what a dream dessert is? A dream dessert (just like it’s counterparts Lush, lasagna, and icebox cake) is a layered dessert casserole. Usually it has a crust of cookies or graham crackers or, sometimes, a baked shortbread crust. The filling is usually some sort of pudding mixed with whipped topping and maybe some fruit or pie filling or more cookies thrown in. Then it’s topped with more whipped topping and garnished. The beauty of these no bake desserts is that they come together in minutes with just a few ingredients. They serve a crowd and are pure heaven…which is probably another reason why they’re called DREAM desserts. 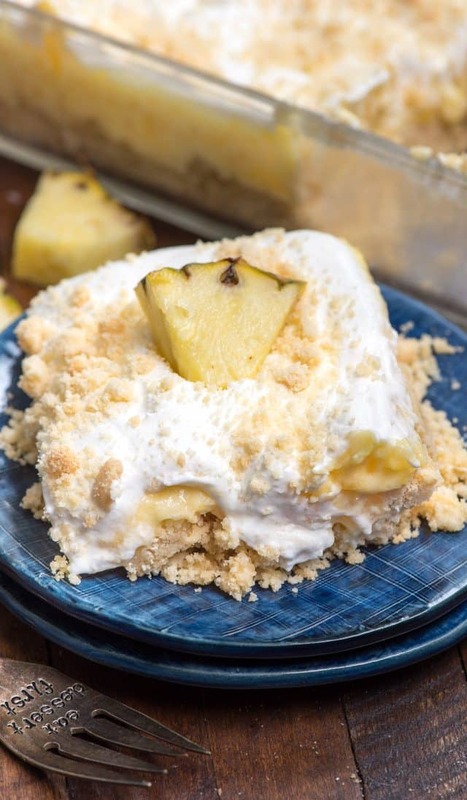 This easy pineapple dessert is full of crushed pineapple and cool whip. It’s kind of like a fluff dessert…but in a casserole pan. Do you ever go to your pantry and randomly find cans of crushed pineapple? Yeah, me too. I don’t know why I even buy the stuff because we don’t eat canned pineapple, but I randomly found a few cans the other day when I was cleaning. The outcome of finding those cans is staring you in the face (and also was made into pineapple fluff). Did you know you can make pudding without milk? I’m serious! You can make pudding mix with crushed pineapple! The juice makes the pudding. It’s kind of a magical moment when it all comes together. The three layers are messy and creamy and crunchy and perfectly no-bake. A casserole like this is perfect for summer! Let’s break down the recipe, shall we? 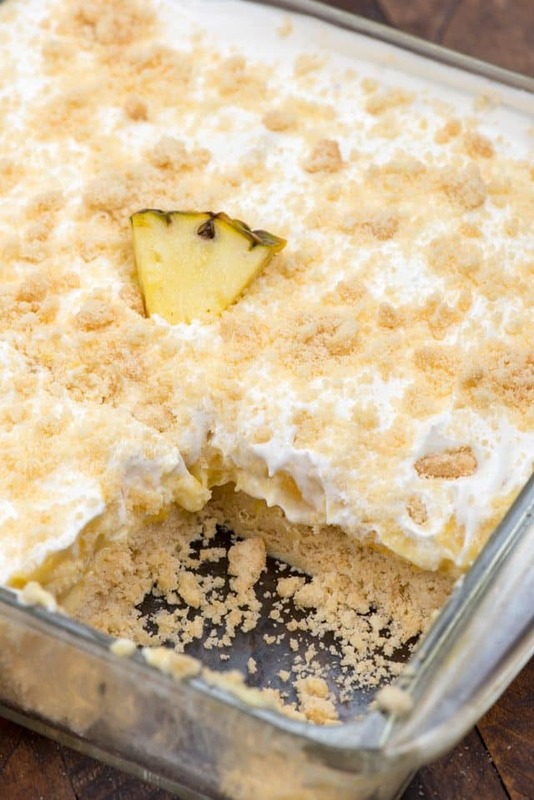 A no-bake Pineapple Dream Dessert is the perfect dessert casserole for summer. It’s pineapple pudding with a shortbread crust! The shortbread layer is made using shortbread cookies. Use your favorite brand (Walkers is my favorite). You could also substitute Golden Oreos or Nilla Wafers, if you prefer. On top of the crust is the pineapple pudding filling, made with instant vanilla pudding and crushed pineapple (or pineapple tidbits). Use the juice to make the pudding! and garnished with more shortbread. Let it sit for a few hours and you have the perfect pie-like no-bake dessert lush lasagna!! 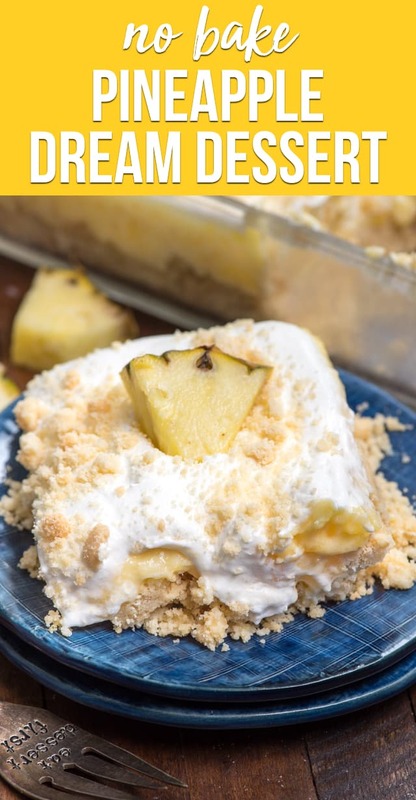 If you love pineapple desserts, be sure to check out this Pineapple Cake Fluff recipe! Mix crushed cookies and melted butter. Press into the bottom of an 8x8-inch or 9x9-inch pan. Stir together pudding mix, pineapple, and half the cool whip container. Spread evenly over crust. Top with remaining cool whip and more crushed cookies, if desired. Chill at least 2 hours before serving. Store in refrigerator covered for up to 3 days. 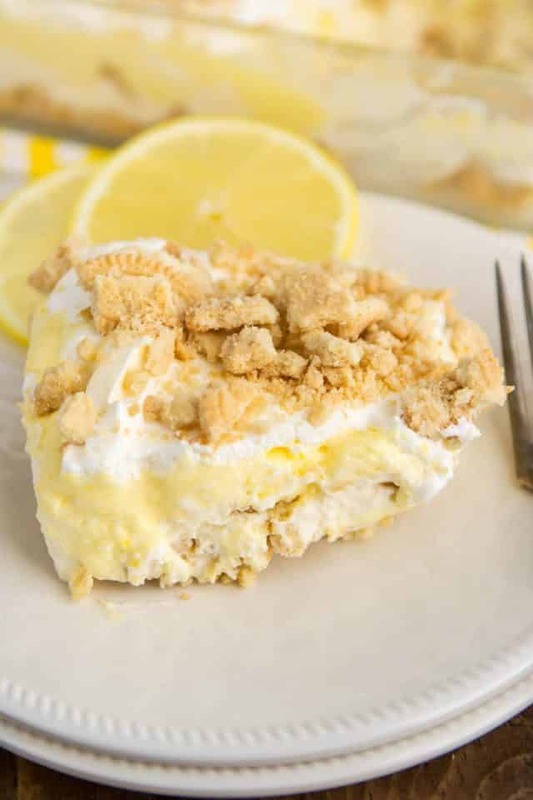 No Bake Lemon Lush Dessert is made even better by using Golden Oreos! 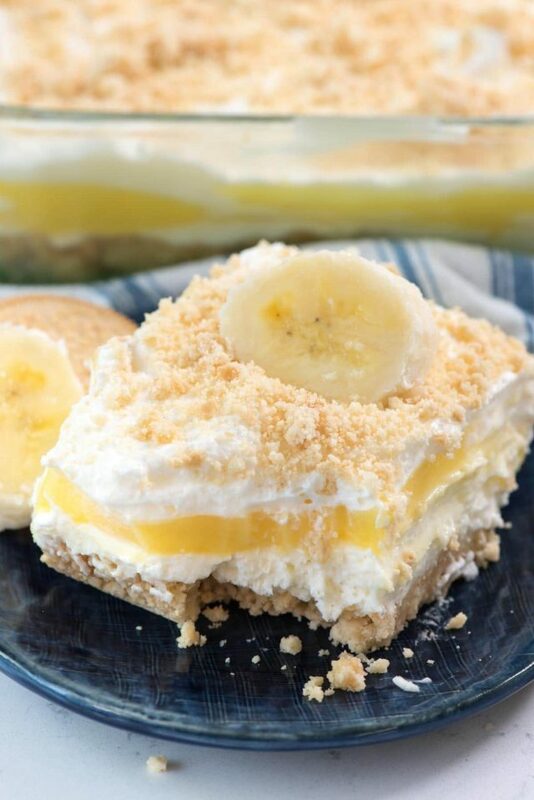 Banana Dream Dessert is no-bake heaven! 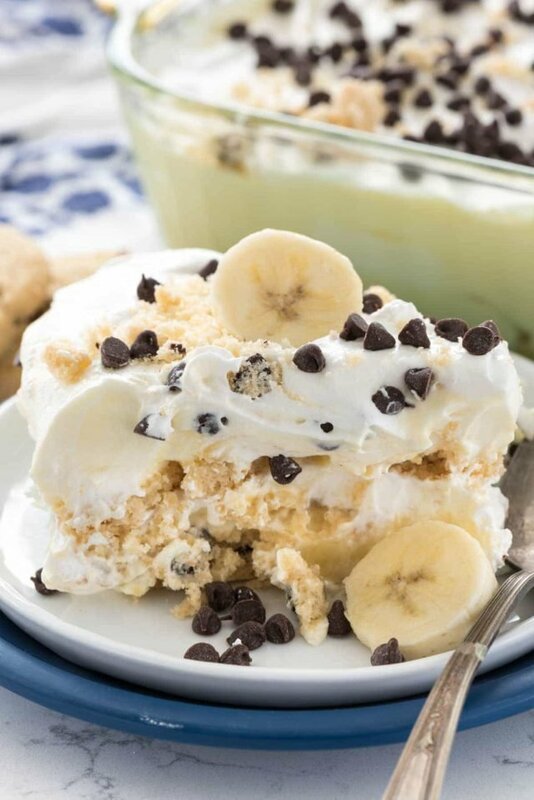 Shortbread Crust abounds in this Banana Chocolate Chip Dream Dessert! Excited to make the Pineapple Dream Dessert! Just need to get to the store. Want to meke the one w/bananas too. Going to also add some finely crushed walnuts to the crumble on top. I made this yesterday using ingredients I had on hand: gluten-free shortbread cookies, cheesecake pudding mix, and fat-free cool whip. It probably sat in the fridge for 6 hours before we had it for dessert. IT WAS SO GOOD! I was honestly surprised that it held its shape. I could slice it and use a spatula to serve. I had envisioned a scoop type dessert – but was thrilled to see it was basically dessert lasagna! I made this morning using Pecan Shortbread Cookies as I couldn’t find just shortbread cookies. I also refrigerated it for an hour after filing it with pinapple mixture as it was a bit warm in the kitchen. My family loved it!